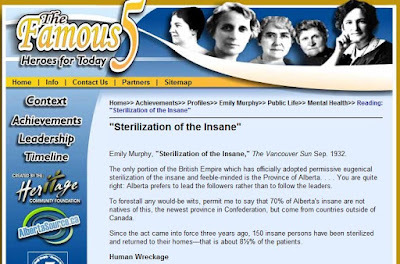 Canadian Feminist pioneer Emily Murphy is hailed as a "hero for today" on the University of Alberta's website despite them including her call for the forced sterilization of handicapped women. "One of the painful experiences of the magisterial life is to take from an insane and violent woman the little baby to which she has given birth during her parole; knowing that someday the child, in turn, is likely to be a patient, owing to the fact that its future was mortgaged before it was born. Awhile ago, in one of our institutions for the care of the aged, it was found that sixteen of the women were feeble-minded and that these had produced 116 mentally deficient children. 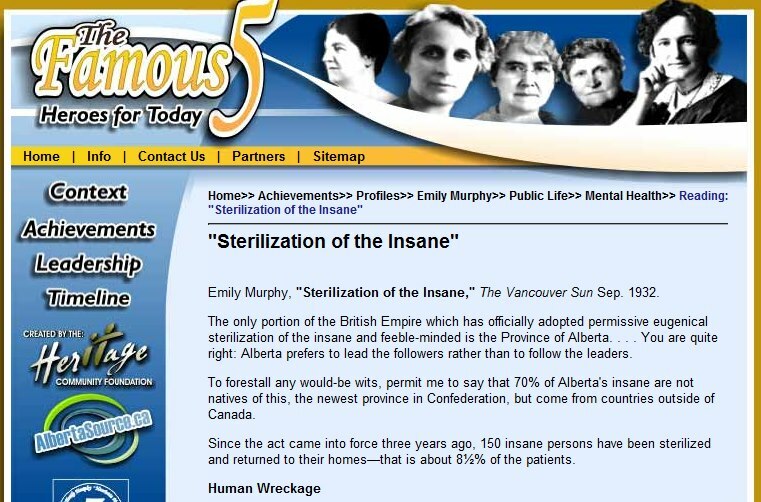 Enquiring into this same matter of descent, it was found in Alberta that out of 3200 persons who had been treated for insanity, nearly 4000 children had been born. It is estimated that one out of every five of these children—that is to say 800 of them—will come ultimately as patients to a mental hospital.... It is quite true that there are tragedies that go on and on. This is one of them. Perhaps, after all, there is not so much credit in being a mother as being fitted to be one"